It’s late in the twenty-first century, decades after humanity battled an alien species in a war for the planet, and while humanity won the war Earth is desolate. The moon destroyed. The remaining members of humanity live on a starship around Saturn’s moon, Titan, and the oceans of Earth provide the energy resource. Jack (Tom Cruise) and Victoria (Andrea Riseborough) are the team stationed with repairing drones, the flying machines that protect the energy plants. There are still pockets of alien scavengers that need to be dealt with. Jack and Victoria make a great team, and dip into romantic companionship, until Jack meets a mysterious woman (Olga Kurylenko) professing to be his wife. Jack begins to doubt the purpose of his mission and wonder if the alien scavengers are the enemy. If you’ve been keeping up with sci-fi cinema in the last couple decades, you’ll likely recognize more than a few elements with Oblivion. From its themes to its plot points to its revelations, there’s little here to designate as original. So the real question remains how derivative can we take? I think when the execution is nimble then it’s one of the easiest sins to remember. Especially in the realm of sci-fi cinema, it’s hard to put together a new story, let alone one set up as a Hollywood star vehicle, without borrowing from other established movies. This in itself is not an issue. Tarantino is a master borrower but he always recontextualizes his artistic influences into something new and different, and while we critics lament his less original career path of late, the man’s box-office profits have never been better in his career. I think when we feel like we’re getting a good story we don’t care when that story has been told before in other manners. Star Wars, after all, has many cultural fathers, but it was a rollicking good time with characters we cared about, so nobody seemed to mind. Likewise, Oblivion has many forbearers from Independence Day to I Am Legend to 2001 to an indie film from a few years ago I shall refrain from mentioning because even the very mention will spoil key plot points. Some will decry the film as a rip-off of superior, headier fare, but I never minded. I was having too good of a time and found the movie too satisfying to quibble. I won’t say the movie is smart per se but it’s far more measured than I would have expected. 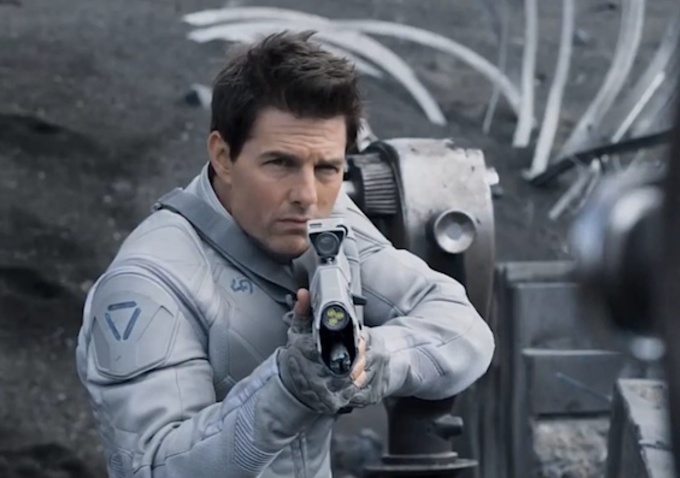 The advertising makes it look like Cruise fights a bunch of aliens and robots, and while there is that aspect, it’s almost an afterthought to a slow-burning mystery that patiently parcels out its revelations, even to the very end of the film. I’m trying to be cagey about certain plot points to avoid spoilers. It’s a film that has more on its mind than explosions, but when it goes into explosion mode, director Joseph Kosinski (TRON: Legacy) makes it count. The larger action elements are well staged and polished with some above average special effects. The sight of the moon dashed across the sky is definitely an evocative image. I love the overall look of the film, Kosinki’s clean, spare, bubbly Apple-esque aesthetics. The drones themselves manage to have personality even with a limited, streamlined design and some choice sound design. The man knows how to hold onto an image and when to keep pushing. The action is suitably thrilling and the drama suitably suspenseful. Actually, better than suitably. I enjoyed the details of this world. It’s probably the spiffiest post-apocalyptic landscape you’ll ever see. This is an entertaining movie that finds nice ways to satisfy, and given the particulars of its sci-fi plot, finds a way to have its cake and eat it too. As a result, Oblivion is a sci-fi flick that offers enough to engage the mind and audience demands for big effects and big thrills. I’ve never been a Cruise hater. I even thought the man tried his damndest to make a movie like Rock of Ages worth watching (a valiant effort but not enough). His character is pretty affable at first and we get to watch as everything he knows comes undone. 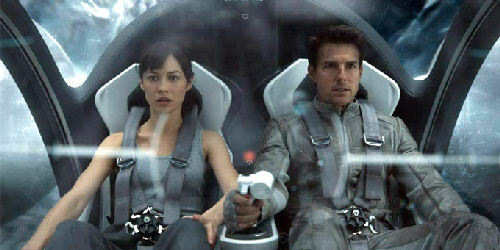 It’s a role that would lead to overacting, but Cruise underplays the part, more alarmed naïf than flinty action hero. 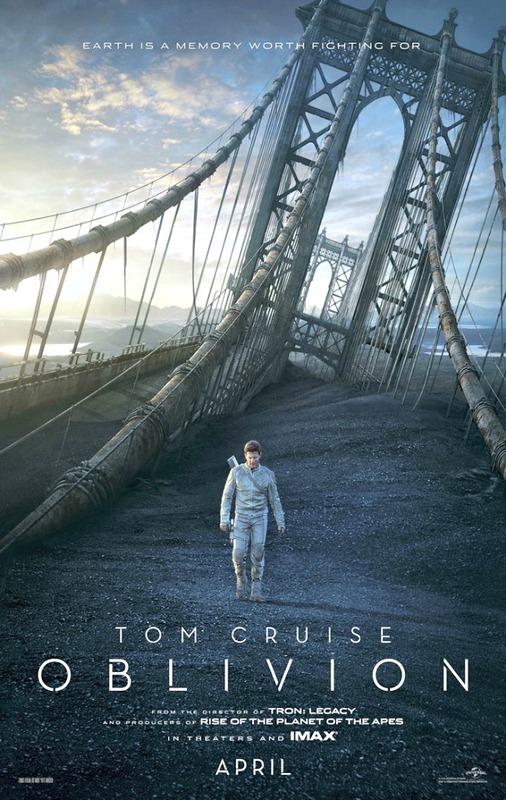 I’m not expecting Oscar-caliber performances in every role but Cruise does a fine job of anchoring the audience and selling his character’s journey. He also has good chemistry with not one but two ladies. Kurylenko (Seven Psychopaths, To the Wonder) is an actress of great beauty and questionable talent, but perhaps being paired up with a genuine star like Cruise brings out the best in her. They’re good together, though my preference was for Riseborough (W.E., Never Let Me Go), an actress who brings a tremulous vulnerability to an otherwise underwritten and confused character that’s more a plot device. Riseborough makes the character so much more than she is on the page. She’s still a relatively new actress so I look forward to her future performances. There are other familiar faces, like Morgan Freeman and an especially unsettling Melissa Leo, but it’s really a three-person acting exercise. Oblivion is a visually alluring sci-fi thriller that also manages to have enough heart and smarts to leave a satisfying impression. The pacing is more deliberate but offers plenty rewards, doling out revelations up until the end, unpacking its mystery with finesse. The first twenty minutes or so, establishing the particulars of this world and the routine of our protagonists, is downright exceptional. The rest of the film doesn’t quite live up to that start but it continues to be an engaging and entertaining movie with some top-notch visuals. The musical score by electronic band M83 also provides a stirring counterpoint to the glossy, clean visuals (the band’s song “Outro” was also very effectively used in that lovely five-minute trailer for Cloud Atlas). You may figure things out as you watch, but you won’t mind, at least I didn’t. The more I step away the more I think back with renewed enthusiasm for the film. It’s smarter, slicker, and just a more satisfying film than we’re accustomed to with this kind of budget and from Hollywood. Posted on April 25, 2013, in 2013 Movies and tagged action, aliens, andrea riseborough, dystopian, joseph kosinski, melissa leo, morgan freeman, olga kurylenko, sci-fi, tom cruise. Bookmark the permalink. 2 Comments. Nice review Nate. Same old type of sci-fi thriller that I’ve seen many, many times before. Nothing new, nothing learned.